Alzheimer’s – a nightmare, a gift or both? 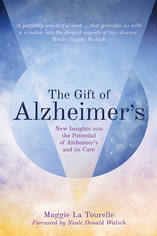 When I tell you that I have written a book called, The Gift of Alzheimer’s, I imagine you might be thinking, “What! I don’t know quite how to take this.” And, as I sense you are thinking this, I am feeling challenged. I understand your disbelief as I imagine your experience of Alzheimer’s was, or still is, very negative. Mine was too in the early stages.